Its renowned surfing competitions and the world-famous Ron Jon Surf Shop put Cocoa Beach on the map, and the weather here keeps tourists coming back year-round. The popular beach town, located on Florida's East Coast, has an overall average high temperature of 82 degrees Fahrenheit (28 degrees Celsius) and an average low of 62 F (17 C). 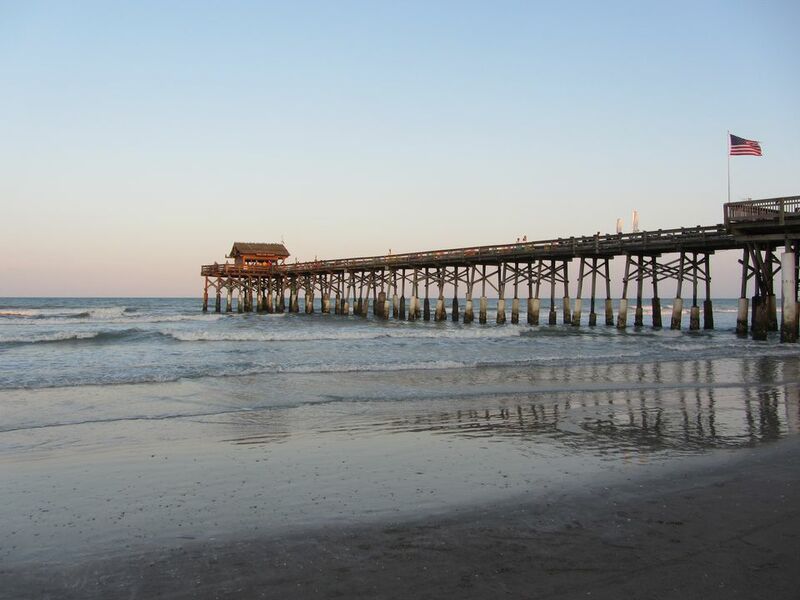 On average, Cocoa Beach's warmest months are July and August, and January is the average coolest month. The maximum average rainfall usually falls in September. The highest recorded temperature in Cocoa Beach was an extremely hot 102 degrees Fahrenheit (39 degrees Celsius) in 1980 and the lowest recorded temperature was a very chilly 17 F (minus 8 C) in 1977. If you are traveling during hurricane season, between June 1 and November 30, you should keep an eye on the tropics for possible storms that may threaten your plans. Be sure to check national weather forecasts and alerts before and during your trip, especially toward the end of the season. Although these tropical storms don't always hit Cocoa Beach directly, heavy rains typically affect most of Florida when they come up the coast. As a result, you should prepare for sudden bursts of intense rainfall between June and November and pack accordingly. The busiest season for tourism in Cocoa Beach is the summer, especially in July and August when temperatures are at their highest. However, the hurricane season also makes the summer the rainiest time of year for this popular coastal destination. You can expect daytime temperatures around 90 degrees Fahrenheit (32 degrees Celsius) throughout the season with nighttime temperatures dropping to around 70 F (21 C). Additionally, temperatures in the Atlantic Ocean are at their highest this time of year at around 84 degrees Fahrenheit (29 degrees Celsius). While this does make summer a great time to swim in Cocoa Beach, it can rain more than 5 inches and over 15 days each month—depending on whether or not tropical storms affect the region. What to pack: Since you'll likely encounter a mixture of sunny and rainy days during your trip, you should prepare for both when packing. Bring shorts, a bathing suit, tank tops, sandals, and other breathable clothing made of light material for the hot days but remember to bring a raincoat, umbrella, and waterproof shoes for the wet ones, too. Temperatures steadily drop throughout the fall season in Cocoa Beach—from average September highs of 88 degrees Fahrenheit (31 degrees Celsius) to average November lows of 60 F (16 C). Many people choose to visit in October when the ocean temperatures are still warm enough to swim comfortably at 81 F (27 C) and daytime highs are a pleasant 83 F (28 C). However, tropical storms tend to happen more frequently in the early part of the fall season, and September is the rainiest month of the year, averaging over 7 inches of precipitation over 14 days. What to Pack: If you're visiting in the first part of the season, you'll likely need to prepare for rain by packing waterproof shoes and a raincoat. However, you'll still have plenty of opportunities to enjoy sunny days at the beach, so don't forget your bathing suit and warm-weather clothes. On the other hand, if you're traveling in late October and November, you should also pack additional layers as temperatures drop into cool territory most nights. As the hurricane season ends, colder weather moves into the region, but temperatures rarely dip below 50 degrees Fahrenheit (10 degrees Celsius), even in January, the coldest month of the year. Atlantic temperatures also drop to about 70 degrees Fahrenheit (21 degrees Celsius), which match the average high temperatures in the air for the season. Winter is a great time to take in nearby attractions like the Kennedy Space Center and the city's many museums and historic sites like the Air Force Space and Missile Museum and the Alma Clyde Field Library of Florida History. What to Pack: Remember your swimsuit when you visit Cocoa Beach; although the Atlantic Ocean can get a bit chilly in the winter, sunbathing is not out of the question this season. However, if you're staying in oceanfront accommodations, you'll also need a sweater or jacket, since evenings along the water can get quite chilly. If you can manage to get away to eastern Florida for spring, you'll be greeted with some of the best weather of the year, especially later in the season. March starts off like much of the winter, with high temperatures in the well above 70 degrees Fahrenheit (21 degrees Celsius) and lows down to 50 F (10 C), but April and May warm up to highs above 80 F (27 C) and lows down to 60 F (16 C). Meanwhile, the Atlantic Ocean also heats up to 79 degrees Fahrenheit (26 degrees Celsius) by the end of May. April is also the driest month of the year, getting just over 2 inches on an average of five days out of the month. What to Pack: You can leave your rain gear at home, but you may still want to bring a light jacket for evening activities near the waterfront. While March isn't great for swimming, you should be able to enjoy the ocean in May, so bring a bathing suit and beach gear if you plan to visit later in the season. Although the central eastern coast of Florida stays relatively warm throughout the year—even in winter—fluctuating amounts of rainfall and daylight hours can affect the quality of your trip.